Brown-Vitter form left-right coalition to break up banks but why? What Problem Does Breaking Up The Banks Fix? 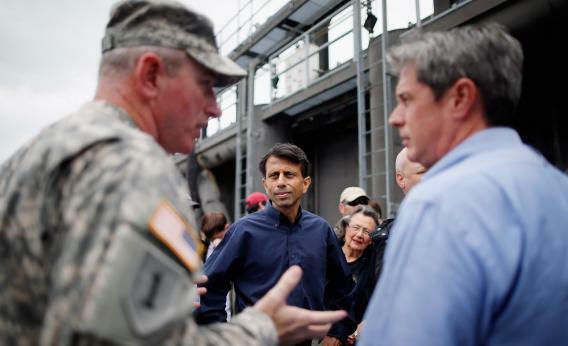 METAIRIE, LA - AUGUST 28: Louisiana Governor Bobby Jindal and U.S. Sen. David Vitter (R-LA) receive an update on the status of the pumping station at the 17th Street Canal during Hurricane Isaac on August 28, 2012 in Metairie, Louisiana. — 1. Breaking up banks will reduce the political clout of major financial institutions. — 2. Breaking up banks will end “too big to fail” as a phenomenon. — 3. Breaking up banks will serve the interests of mid-major banks. — 4. Breaking up banks gives Republicans something to talk about while in practice they work to subvert the regulatory framework. — 5. Breaking up banks is a slogan people understand that can be used as a focal point for a broader regulatory agenda. Number one is, I think, wrong. At any plausible size, JP Morgan and Goldman Sachs are going to be major employers in New York City whose interests and concerns politicians from New York and New Jersey pay attention to. Michigan lawmakers care about the Michigan-based auto companies, Iowa legislators care about major corn producers. If anything a less concentrated financial sector might have more political clout. It turns out that the auto dealers’ lobby is more powerful than the auto manufacturers’ lobby in part because they’re more broadly distributed. Long story short, I don’t see (1) as a compelling basis for action. Number two I don’t quite see. The thing about “too big to fail” is that nobody responsible for bailing out TBTF institutions has ever actually cited size as the key consideration. The issue is that from time to time policymakers regard a direct bailout of an insolvent bank’s creditors as being a less socially costly way of stabilizing economic growth than the alternative. Lehman Brothers was not a particularly enormous financial institution, and TARP funds were injected into far more than the top four or six banks. It’s possible that bailout logic is mistaken, and in fact there are appealing alternative means of stabilizing the macroeconomy (Scott Sumner says we should just promise to level-target nominal gross domestic product and it’ll all work out) but size is neither here nor there. Number three is clearly true. Your PNCs and Suntrusts and Keycorps and the Fifth Third Bank are not exactly cuddly community banks. And yet they’re far smaller than a Citigroup or a Wells Fargo. Cutting their bigger rivals down to size through the regulatory system would, I’m sure, be welcome. Number four is where I get really suspicious. Nobody’s going to say “we need to defund Dodd-Frank, punch loopholes in it, and work to repeal it because we need a subsidized but totally unconstrained financial sector.” You’ve got to say something. So pointing at the things Dodd-Frank doesn’t do—resolve the status of Fannie & Freddie or constrain the size of large banks—can be a nice pony plan to go hand in hand with the deregulatory agenda. It’s potentially the financial regulation equivalent of the “let’s build Keystone and not apply Clean Air Act regulation to power plants because the real answer is carbon pricing” theory of politics. That’s not Sherrod Brown’s game. He fought to have bank size caps put into Dodd-Frank, and when he lost he soldiered forward backing the regulatory passage at hand while on a separate track continuing to work on the bank size issue. But Richard Fisher? I’m not so sure. Number five seems to be what Brown is about, it’s the avenue Anat Admati is persuing with her bank capital crusade, and I have no problem with it. Political organizing is hard and people need to come up with strategies. So good for them. But again, is there really a bipartisan movement here? I’m not so sure. I’m not saying there isn’t. But I have my doubts. To me a key question is do people want to reduce bank size as part of a regulatory strategy or as an alternative to a regulatory strategy. Those are two very different policies. My view is that the right direction of causation is that better-regulated banks would be smaller and much less likely to fail, but that’s not the same as saying there’s a class of “Too Big To Fail” banks that can be shrunk down and forgotten.